Sometimes words just don’t express well enough what a person means to you or your family and today was one of the days we had to say a good bye. After nearly 3 years, my son transitioned from birth to 5 services today and will now be solely in the care of the school. It is exciting and scary. It is heart breaking and wonderful all at the same time. He has made soooooooo much progress… as in when he started he could not say “cheese” for the camera… or really anything at all to now being asked to keep his voice down at night when he goes to sleep. Sweet blessings. My son’s speech therapist is the chief one to thank for that success. She has been with my son 4 days a week, nearly every week, for those 3 years. So when it comes to thinking about what to get her or any other special teacher or therapist to show them an extra bit of gratitude, it can be a bit tricky and mentally challenging. Do you have to get your child’s teacher, therapist or para-professional/teacher’s aide something at the holidays or at the end of the year? Certainly not. With this list however, you might find a little help if it is something you decide to do. 5) A simple card with picture. Thank you gifts don’t need to be expensive. A hand drawn picture or gift is always a sweet and simple way to say thank you! Personal pictures are great too… especially if you can capture a series (think first and last day) or a pivotal success! We love to remember those. Don’t feel like you can do either? 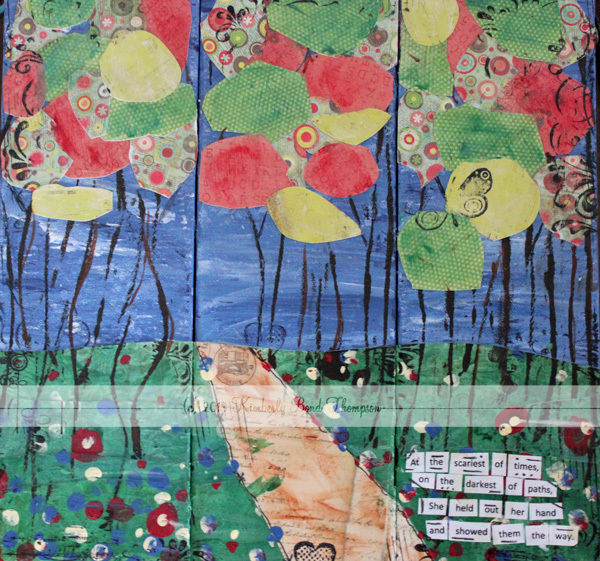 How about a poem from the heart or an inspirational quote in a pretty frame? At the darkest of times on the scariest of paths, she held out her hand and showed them the way. 4) Gift cards. Who doesn’t love a good gift card? Take a moment to think about what your receiver likes… coffee on the road? Target? How about something more indulgent like a manicure/pedicure if you notice their fingers are always lovely. 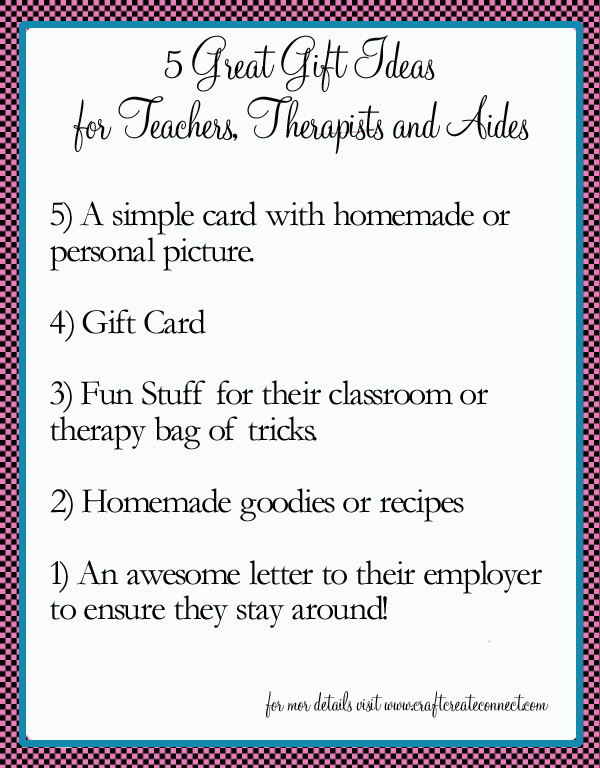 A fuel card for the traveling therapist or teacher is always a great idea! With all of the apps flying around these days, an itunes gift card would work too! 3) Stuff for their “bag of tricks” or classroom. Does your teacher love books to read to the kiddos? Is your therapist always playing games or doing puzzles? Cool post it notes or a fun funky pen…Actually, a big sturdy canvas bag is a great gift too! 2) A home made treat from the kitchen. How can you go wrong with a yummy snack? Don’t feel like your baking skills are up to snuff? Try a recipe in a jar or even a group of mom’s tried and true recipes printed on pretty cards. 1) A letter to their employer. I never really thought about this as a gift until as an administrator I passed along a glowing email from a parent to their therapist. Therapists and teachers take pride in seeing their students succeed but seeing in writing how a parent actually feels in a positive way is truly priceless. Think about this letter as a guard against burn out and a step toward helping to ensure that a great teacher or therapist is around doing good things for a long time! If you think that this information is useful, please feel free to pin it using the Pinterest button below! For a list of items we have given teachers over the years, check out the posts here!